Frequent visitors may recall that in the last post we took a look at a pristine Yamaguchi "Gold"sent in from S-san of Hokkaido. 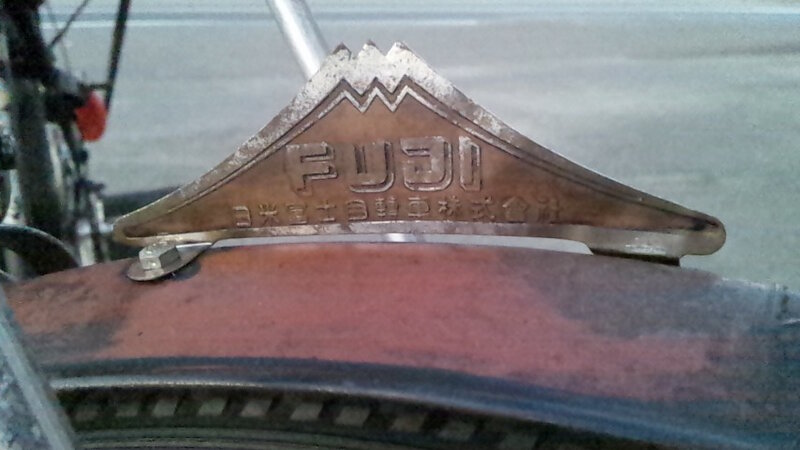 In this installment, we will take a look at another one of S-san's vintage Japanese bicycles, a 1952 Nichibei Fuji carrier bicycle. 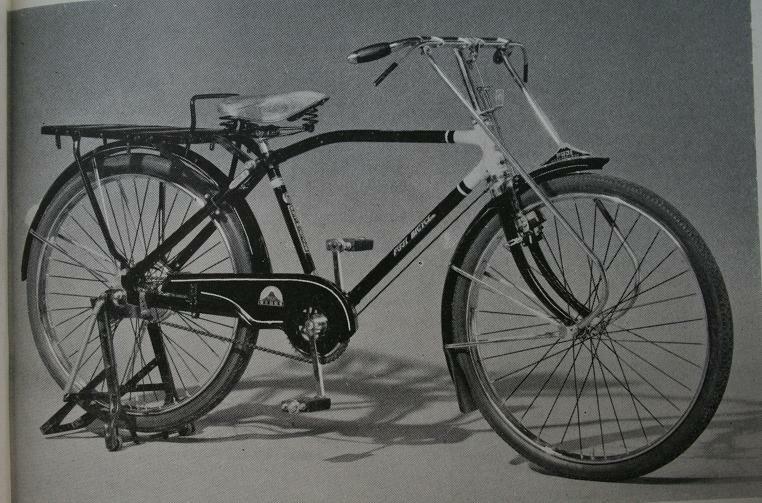 Compare the above photo with the one below, taken from a 1953 catalog. 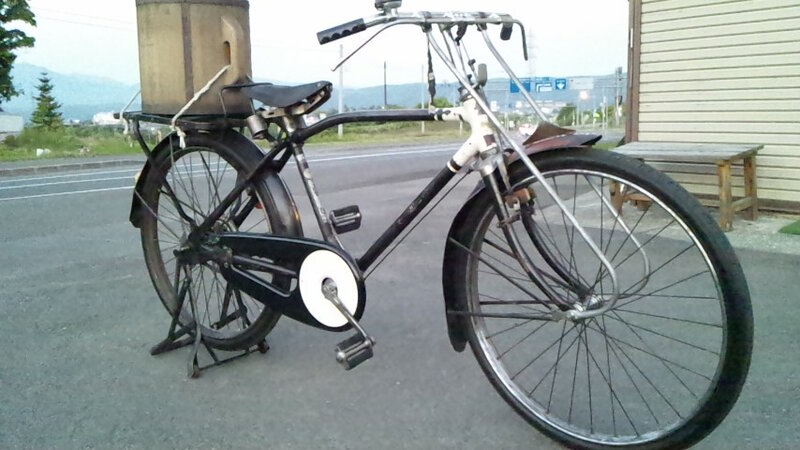 Looks to be nearly complete as far as being original is concerned, though the chaincase may be replacement which is quite understandable given the age. has a nice rich blue cloisonne, typical of this period. 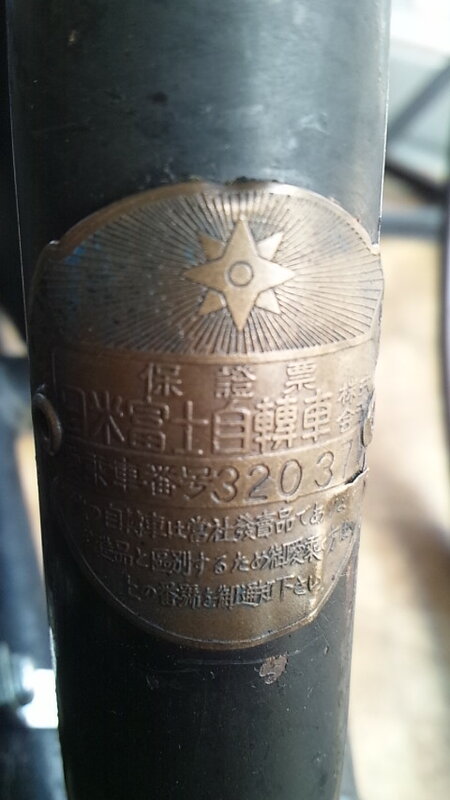 Guarantee badge on the lower portion of the seat tube. 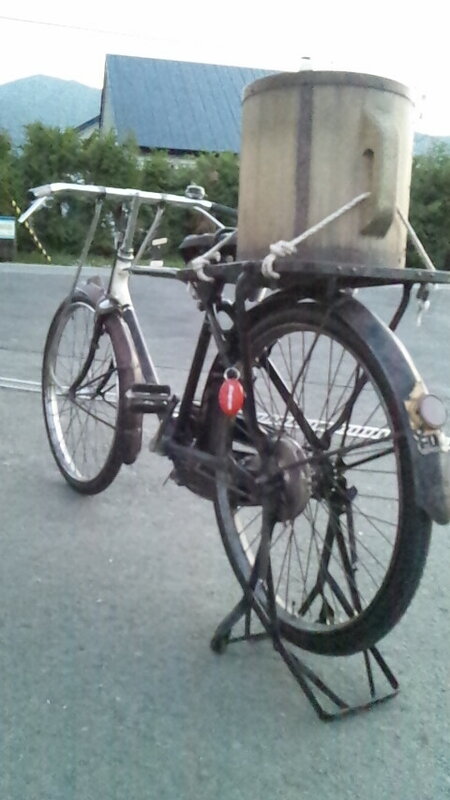 bicycle 自轉車 as opposed to their modern day counterparts 保証書 and 自転車. 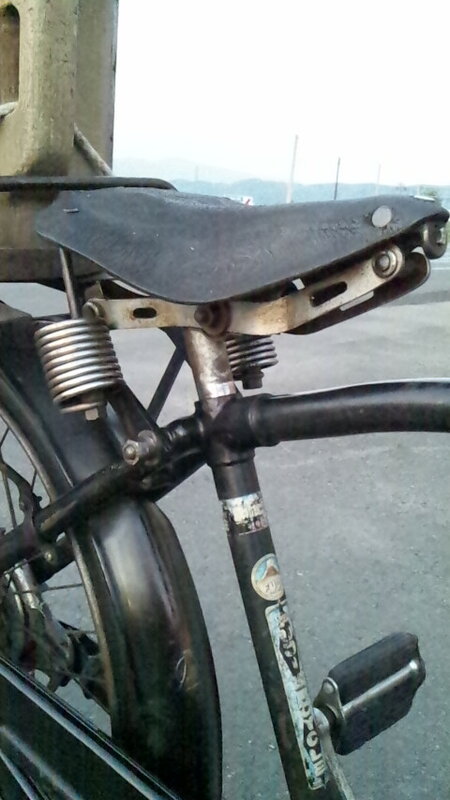 Check out the frame and springs on the heavy duty saddle. 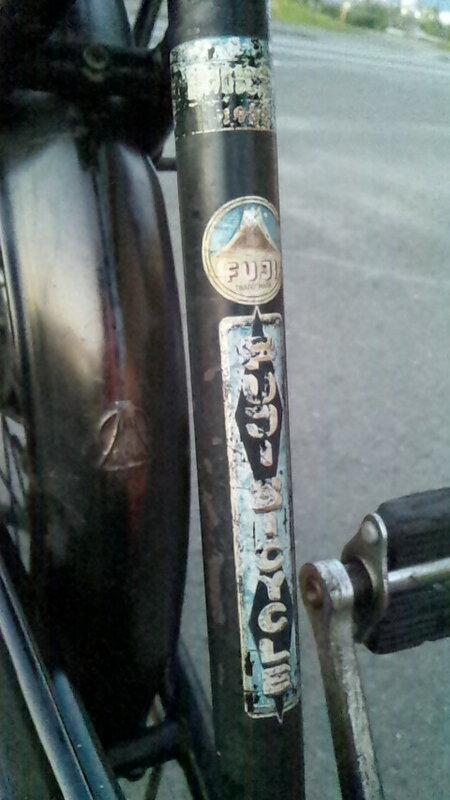 That is what I love about these old bicycles, everything is built to last, above and beyond the bare minimum. 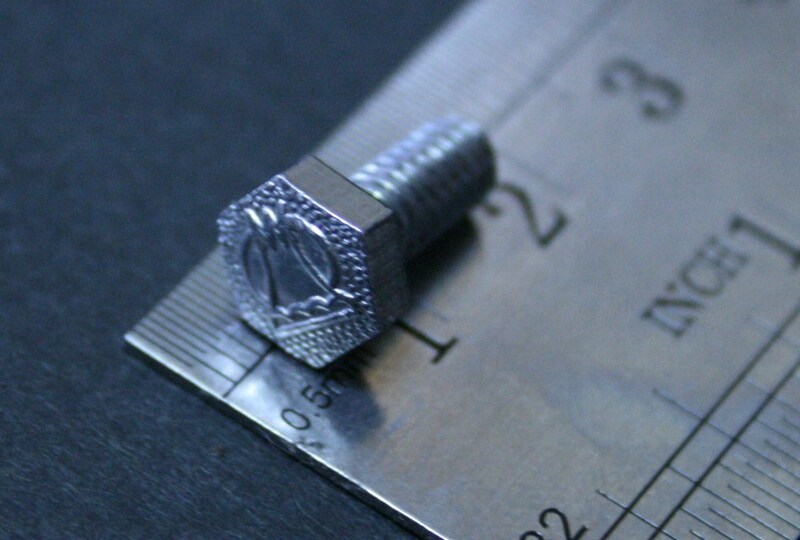 Guess that is why they last so long. 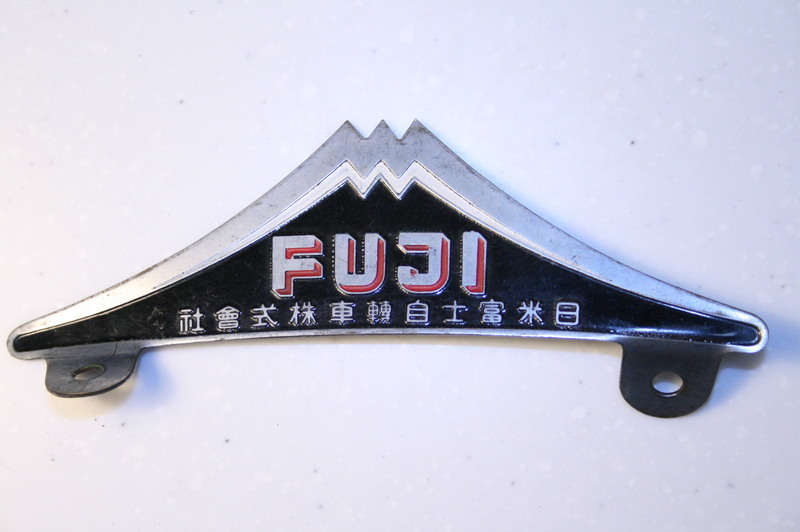 Note how the lock case is designed to emphasize the Nichibei Fuji logo mountain peaks. 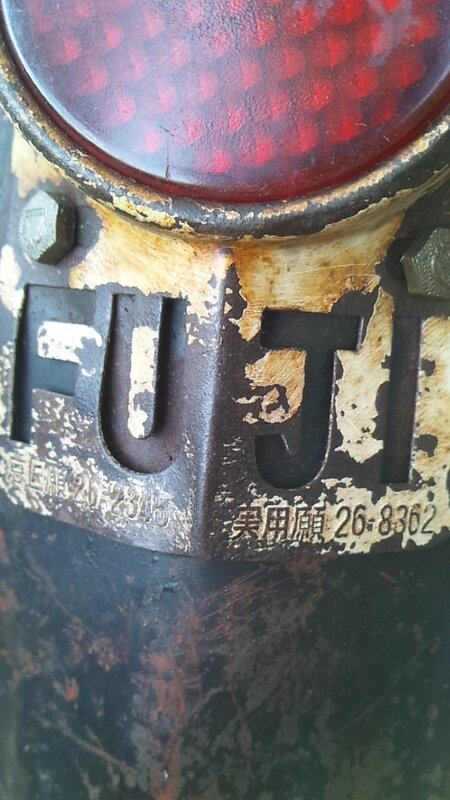 Note the Fuji logo on the heads of the fender stay bolts. 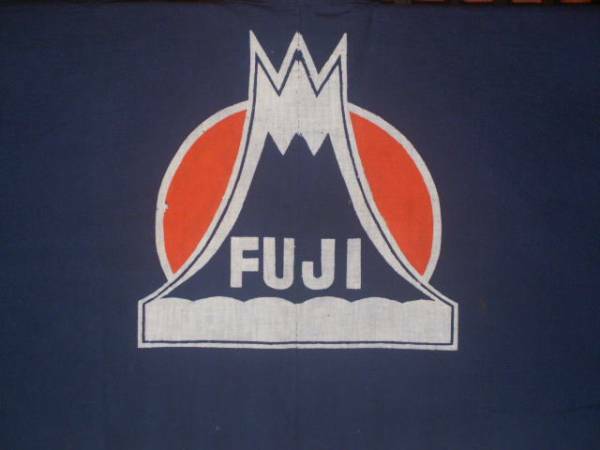 Note the letters for FUJI cut out. 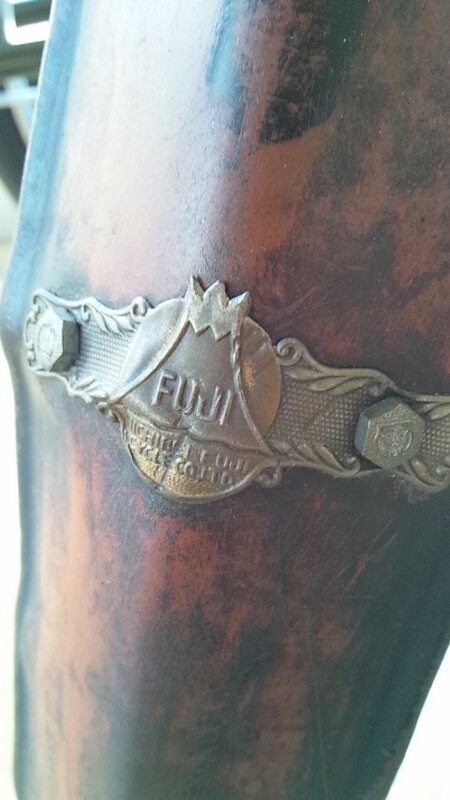 As seen earlier with the fender stay bolts, the heads of the reflector bolts also have the Fuji logo. 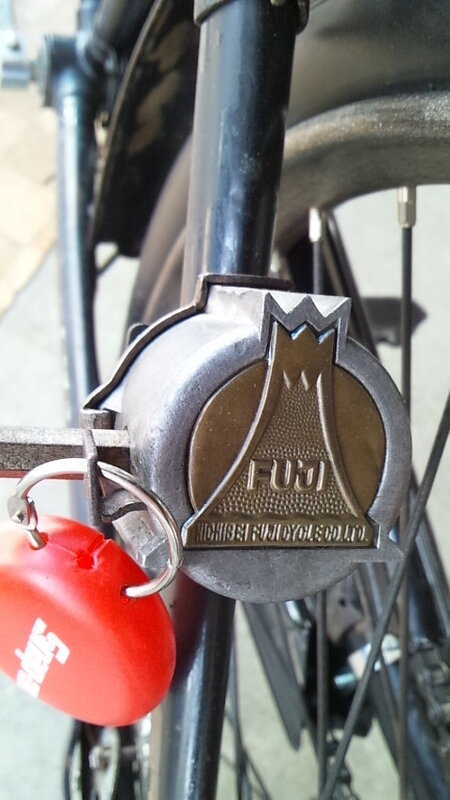 Note the shape of the fender ornament is in the shape of Mt Fuji. Large carrier for hauling just about anything. 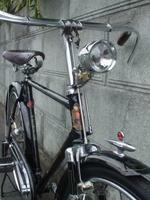 Also note the shape of the handlebars, perfect for putting some muscle into hauling a heavy load. And the rear stand complete with wheels to make it easy to put the stand up or down when the rear carrier is fully loaded. 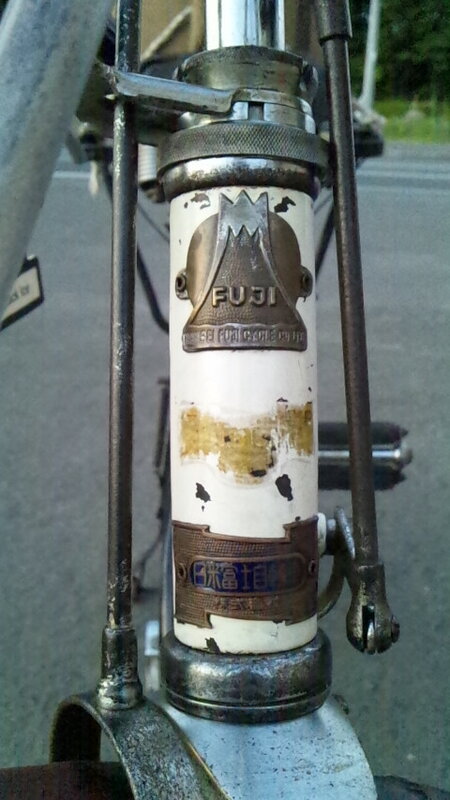 Many thanks to S-san again for sharing photos of his beloved two wheeled buddy. 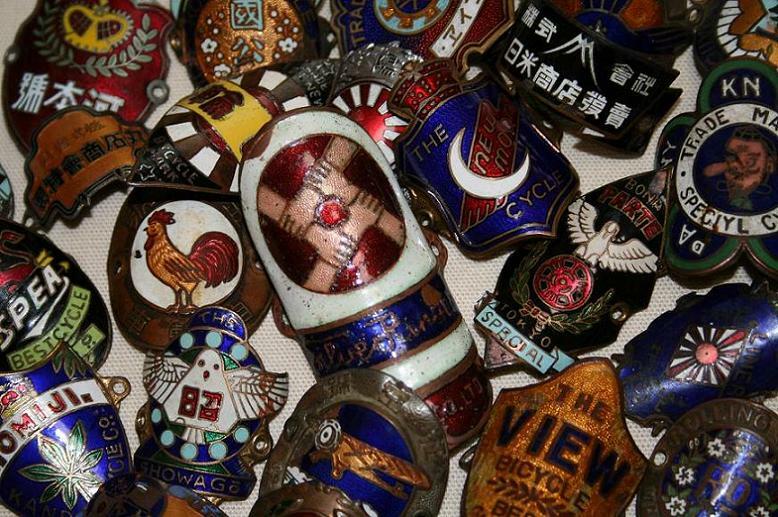 If you have photos of your vintage Japanese two wheeled buddy that you would like to share with fellow enthusiasts, send them to showajitensha@hotmail.co.jp along with a description.